Private developers are returning to the property market in Galway, but state agencies have also recognised that they need to generate supply in order to build commercial facilities and attract international employers beyond Dublin. IDA Ireland, the state agency for attracting overseas employers, is starting work on another new building in Parkmore Business and Technology Park. This 3,250-square-metre advance technology building will be its second project in the park since the economic recovery got under way. The builder of that facility, Rhatigan Group, has also submitted plans to transform a 12-acre site at Crown Square in Wellpark, which it says will be the largest mixed-use development in Galway. It will accommodate more than 37,500 square metres of office space, a 180-bedroom four-star hotel, 290 apartments, a neighbourhood centre, entertainment and convenience-retail elements, cafés, restaurants and a primary care centre, set around a public square. According to Cushman & Wakefield’s Patricia Staunton, prime headline rents in Galway city remained stable at €296 per square metre in 2018 and she forecasts upward pressure of 9 per cent for 2019 to €323 per square metre. “While new, high-specification buildings are achieving up to €325 per square metre, Galway is not performing to its market potential at present and remains hampered by the lack of large Grade A product to meet demand,” she said. Staunton also expects prime office yields to hold stable in 2019 at 6 per cent after compressing by 25 basis points in 2018. Cushman’s recent research shows that just 11 occupiers took space, totalling 3,750 square metres last year, which is significantly below the long-run average for Galway of 13,150 square metres. About 7,000 square metres was under construction in Galway at year’s end, of which 6,500 square metres is being developed at No1 City East in the suburbs. This month, Gerry Barrett is due to begin development at Bonham Quay in the city centre providing 26,000 square metres of Grade A office space. A further 46,000 square metres is in the planning pipeline for the suburbs. These include McDonogh Capital Investments’ plans for the first phase of its €120 million Eastgate Business Campus adjoining McDonogh Trade Centre and Ballybrit Industrial Estate in the northeastern suburbs. However, the city council’s planners have requested the developer submit proposals for additional facilities including gyms, convenience stores, shops, restaurants and childcare services. Initial plans for the first phase feature 17,300 square metres of Grade A offices around a public plaza. The overall development will also include a hotel. An interesting test of the Galway retail market will be the sale and leaseback by bookseller Eason of its city centre property. Agent Darren Peavoy of Bannon is quoting €8 million for the premises at 33 Shop Street. Eason is to take a 25-year lease on the building at a rent of €525,000 per annum, which would equate to a net initial yield of 6 per cent. A guarantee from Eason Operations Ltd will cover ten years of the lease. Located on Galway’s high street, No 33 is a part two-storey and part three-storey building extending to almost 1,043 square metres, including 834 square metres of retail space over ground and first-floor levels. Earlier this year, Cushman issued a report saying that prime Galway Shop Street rents remained steady at €2,400 per square metre in 2018 while prime retail yields sharpened to 5.5 per cent. It also forecasts a modest softening of about 25 bps for high street yields in Galway and other regional cities this year. Towards the end of last year agent TWM sold Unit 217 Eyre Square shopping centre to Marathon, owner of the majority of the shopping centre, at a net initial yield of around 8.2 per cent. TWM had been asking €1.6 million for the unit which would have equated to a yield of about 8.7 per cent. TWM’s Sarah Winters estimates that, in all, last year investors purchased €90,761,600 worth of property in Galway, which was offered in lots worth more than €1 million. Earlier this month, a Galway-based investor bought 13 three- and four-bedroom houses pepper-potted within the Cúirt na hAbhainn development in Claregalway, for €1.8 million including Vat. Some of the units were occupied, generating €31,500 in annual rent; however, a number required completion works. 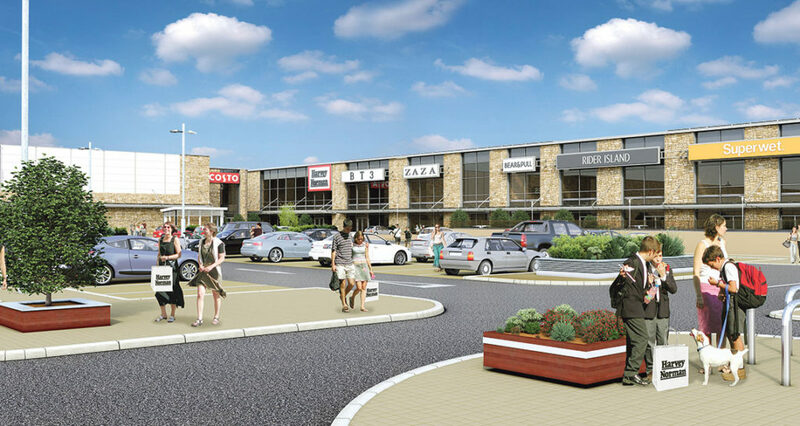 Meanwhile in the western suburb of Knocknacarra, Sigma Retail Partners is progressing the €35 million development of phase two of Gateway Retail Park adding 11,600 square metres of retail space to the scheme. Phase 2 is due to open in 2020. Owned by US fund Oaktree Capital, it aims to make it one of Ireland’s largest shopping destinations. Already agent Bannon has signed up electrical and interiors retailer Harvey Norman, for 5,570 square metres over two levels. Darren Peavoy said there had been strong interest in all of the remaining retail space, especially for the F&B [food and beverage] units, while the creche and gym units were under offer. In the industrial sector, Cushman estimates that prime rents for Galway logistics and warehousing space increased by €5 to €80 per square metre in 2018 and, driven by limited supply, the agent forecasts rents could reach €86 per square metre by the end of this year. Rents are higher for manufacturing units in Galway at €86 per square metre at the end of December and these could rise to €97 per square metres by the end of 2019. This sector has also seen little new supply with only 1,150 square metres added at Mervue Business Park in the last quarter of 2018.